This weekend marks nine years since I started this blog. Initially, my posts were really just short remarks or observations, much like what would become standard content on Twitter years later. I think the longest post I had on there was a wordy rant about how much I despised the film 'Lost In Translation'. 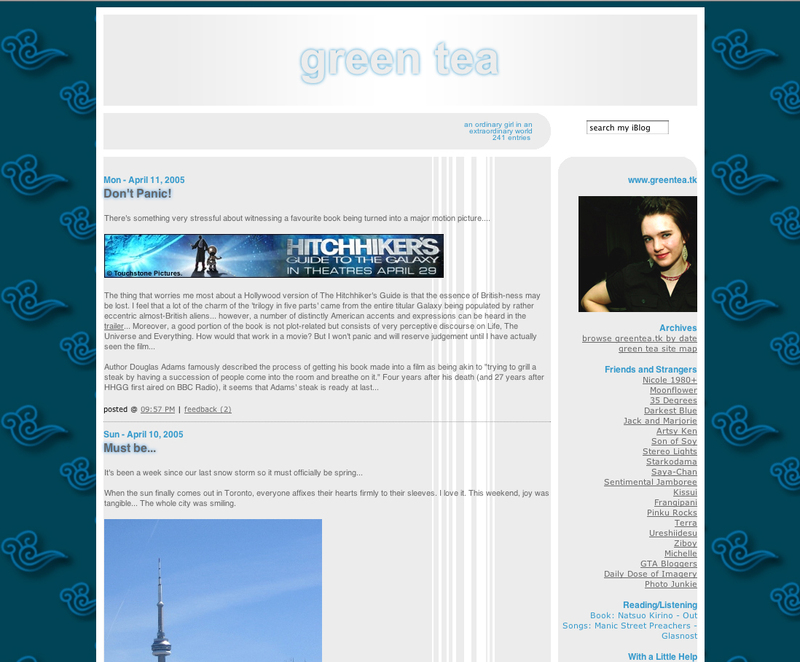 From 2003 to 2005, I was using a clunky program called iBlog to publish Greentea.tk. iBlog did not support web-based site management. When my laptop died in 2005, there was no way for me to access and manage my iBlog site anymore. Very short-sighted. So, I set up this Blogger page, redirected my URL and abandoned the first two years of posts. My earliest blog layouts had banners made from scanned origami paper. iBlog screen shot circa 2005. I made the swirly cloud background myself! I wonder, if I had chosen a niche early on and really made an effort, could I have made a living off blogging? I was an early adopter of the hobby but when most bloggers started focusing their writing on a particular subject, I did not. Yes, I love to write about travel and Bhutan especially but I know I am not considered a go-to source for info on any particular topic. I am a generalist and also guilty of the personal diary type of post. I have vague fantasies about being a proper travel blogger but I suspect that I am not cut out to produce quality written content quickly. There are post drafts that have been at the back of my mind for years that I haven't managed to type out yet. I have just put together a new page here, called 'Best of greentea.tk', which lists my most popular posts based on the number of page views (a very wide range of topics!) and a list of the posts I like the most myself (primarily travel-related). Check it out in case you missed something of interest! Congrats on 9 years! It takes a ton of dedication to keep it up. I wondered also, had I taken a different approach, would I be able to make a living blogging but, honestly, that's a lot of work and a lot of soul selling. I wouldn't want to bore myself or my readers (who have become friends) with hocking a bunch of sponsored posts.